My books are available around the world on Amazon in the following countries if you are interested in finding them, just follow the Amazon links below. Thank you so much for your interest. I am an Amazon affiliate. This doesn't alter the price for you at all. The links here are the same ones as on Amazon. For all other countries, please follow the links above at the top of this page. When junior lecturer, Edward Wiley, dies an horrifically painful death and police pathology can't establish the cause, Professor Green is desperate to help solve the crime, especially as it happened in her own back garden. Professor Elizabeth Green is a lecturer of plant sciences at the University of Cambridge, specialising in poisonous flora. From time to time Cambridgeshire police, especially Inspector Abley, call on her skills to help deal with cases involving poison. And there are more cold blooded, calculated murders using poison recently in the city! Elizabeth's consultancy role, providing expertise on poisonous substances, never stops where it should, as this pushy sleuth always oversteps the mark with her meddling. In her fifties, Elizabeth Green is quintessentially english. An eccentric professor in her ivory tower, she maintains a sharp wit, yet is flawed by her inability to connect well with people, instead giving off a cold, opinionated and sometimes acerbic air. Though in her own defence, she is very kind to animals and a great gardener. In truth she keeps her friends close, and only lets a few dear people into her world. Focusing on new priorities, we pick up in this first book with Elizabeth having been on a break from solving crimes. Devastated by her husband's death just a year ago, Elizabeth hates to feel invisible or let her life pass her by. Both the bumbling and kind Inspector Abley, and her effete grandson, Godric, who is at the university and living with her at the moment, think she should steer clear of getting involved with the police for a while. But no matter how strong their protests, Elizabeth is determined to be useful again. Following another grisly murder, a tense Inspector Abley realises he can't solve this crime without Elizabeth. With people dropping like flies, Elizabeth's unbridled curiosity embroil this meddling sleuth right in the heart of this mysterious case in this historic city. She isn't shy to call on her intellectual and loyal friend, Emily, who also gets pulled into things whether she likes or not. Elizabeth's main companions are Inspector Abley, an amiable, bumbling man, easy in his own golf-course preserved skin, who is kind and nothing like an Inspector should be. Preferring to spend time at the Gog Magog course trying for a hole in one, than out investigating a murder, Abley likes Elizabeth dearly, despite her significant flaws. Godric, Elizabeth's grandson, is an extremely handsome and misbehaving undergraduate, preferring her cream cakes and civilised living arrangements with all its small luxuries, to that of a draughty small college room. He is a hedonist and is heading for being sent down by the university for zero effort in the classroom department. We meet him after he's had a fall off a 'push scooter', after larking about with Perry Sidcup. He may be a bit of a bacchanalian, but he loves his nanna dearly. With all its sumptuousness of college high table, chapels, the meandering River Cam, punting, rowing, the leafy spaces of Jesus Green and Midsummer Common, the first book in this series, Poison, covers the landscape of this historic city. Intrigue and suspense occur right in the heart of college life. With Dons involved, both town and gown mingle as murder takes hold of the dark cobbled streets and alleys. Readers of Agatha Christie, Marple and Poirot, who love the classic whodunnit crime murder mystery will be at home in the world of the Cambridge Murder Mysteries. They may also appeal to readers of James Runcie's Sydney Chambers Grantchester Mysteries. The porters at All Saints’ College, Cambridge, feel under threat. Witchy spells, hate mail and buckets of flour over the Porters’ Lodge. Are these just harmless student pranks or are they in real danger? Inspector Abley's mind is elsewhere, so Professor Elizabeth Green starts to dig out clues to try to help, but can't solve the mystery before the death of a porter. With famous stones also going missing, and privilege and pomp getting in the way, will Professor Green be able to unravel the mystery before another porter dies? If you love Cosy mysteries this one is a treat. And one for readers who love a traditional English backdrop, as Cambridge bleeds through every page. When horses and boat dwellers are found strewn and lifeless by the river in the early hours of an autumnal morning, is someone trying to send a message? With Inspector Abley still suspended, amateur sleuth Professor Elizabeth Green steps up to help Sergeant Lemon find out what caused this incident on Stourbridge Common, and whether it was someone trying to poison the horses. But just as Sergeant Lemon and Elizabeth Green start to gather evidence, Professor Crowhams at the Institute of Galileo at the university is hit over the head. A hugely unpopular man, he also hates horses. The plot thickens with a death! And when it turns out that a couple of staff at the Institute of Galileo also live on the boats near where the horses were poisoned, Elizabeth Green wonders if the answer might lie not too in petty academic squabbles and jealousies. If you'd like to read BLOOD MOON, just click on the link here, or above if out of the UK. Animal Tales is a series of books about animals, featuring animals. They can be read independently of each other. They feature different stories and characters who are not linked to each other. But they are a series as they have animals in common. Barnaby Chester didn't know what it was to feel the love from a dog, until he met Pup. Then there were no lengths that he wouldn't go to keep Pup safe. But when they went on the run things could never be the same. 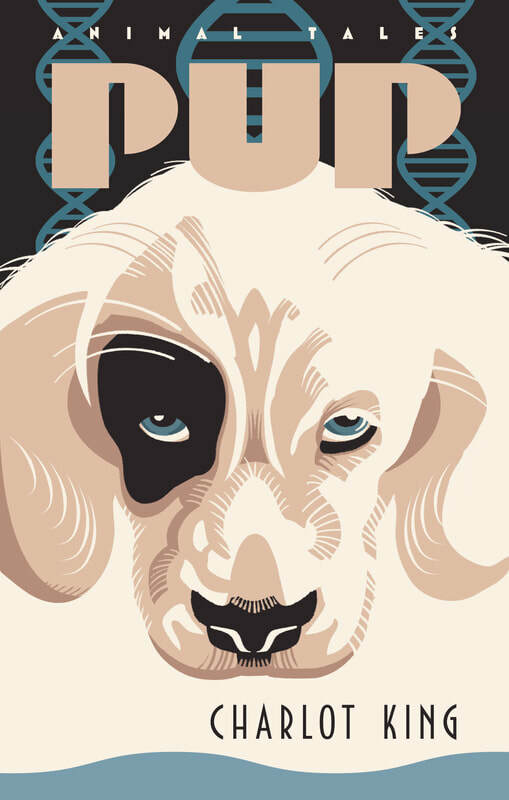 In this dark science fiction, is one transgenic animal a harbinger for the dystopian future, or the light to stop the madness? WOOF is Bk2 of Animal Tales. It is also available around the world on Amazon Kindle link. UK link is HERE. For all other countries, please follow the links above at the top of this page. The editor of the magazine 'Woof', an Afghan Hound from New York called Brooke, is worried about her two legger, Terry. They have left for North Norfolk to chase up a story about a dog festival, as it might be their last hope. But when they get there, things aren't what they seem. If you like dystopian novels, with animals at the heart of the story, then Charlot King's futuristic science fiction might be one for you.